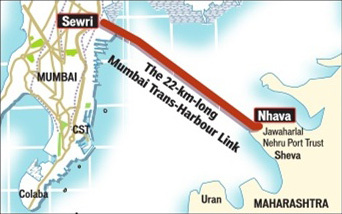 The Mumbai Metropolitan Region Development Authority (MMRDA) has shortlisted in all 29 contractors for the 3 packages of the 22-km long Mumbai Trans Harbour Link Project. The Authority has shortlisted 7 contractors each for the first two packages and 15 for the third package. The seven contractors for Package-1 running from Sewri up to 10.38-km are – 1) consortium consisting of M/s.AFCONS Infrastructure Ltd., M/s.FLUOR Australia Pvt.Ltd. and M/s.Shapoorji Pallonji & Co.Pvt. Ltd.; 2) consortium consisting of M/s.Daweoo Engineering & Construction Co.Ltd. and Tata Projects Ltd.; 3) consortium consisting of M/s.Gayatri Projects Ltd. and China Railway Major Bridge Engineering Group Co.Ltd; 4) consortium consisting of M/s. Hindustan Construction Co.Ltd. and M/s.SK Engineering & Construction Co.Ltd. ; 5) consortium consisting of M/s. IL&FS Transportation Networks Ltd. and M/s.SP Singla Constructions Pvt.Ltd. ; 6) consortium consisting of M/s.ITD Cementation India Ltd., M/s.Simplex Infrastructures Ltd., M/s.Italian Thai Development Public Co. Ltd. and M/s.Sumitomo Mitsui Construction Co. Ltd. and 7) M/s.Larsen & Toubro Ltd. India and M/s.IHI Infrastructure Systems Co.
1) consortium consisting of M/s.AFCONS Infrastructure Ltd., M/s.FLUOR Australia Pvt.Ltd. and M/s.Shapoorji Pallonji & Co.Pvt. Ltd.; 2) consortium consisting of M/s.Daweoo Engineering & Construction Co.Ltd. and Tata Projects Ltd.; 3) consortium consisting of M/s.Gayatri Projects Ltd. and China Railway Major Bridge Engineering Group Co.Ltd; 4) consortium consisting of M/s. Hindustan Construction Co.Ltd. and M/s.SK Engineering & Construction Co.Ltd. ; 5) consortium consisting of M/s. IL&FS Engineering Ltd. and M/s.Ranjit Buildcon Ltd.; 6) consortium consisting of M/s.ITD Cementation India Ltd., M/s.Simplex Infrastructures Ltd., M/s.Italian Thai Development Public Co. Ltd. and M/s.Sumitomo Mitsui Construction Co. Ltd. and 7) consortium consisting of M/s.Larsen & Toubro Ltd. India and M/s.IHI Infrastructure Systems Co.
Further, the 15 contractors shortlisted for Package-3 running from step 18.187 up to Chirle are – 1) consortium consisting of M/s.AFCONS Infrastructure Ltd., M/s.FLUOR Australia Pvt.Ltd. and M/s.Shapoorji Pallonji & Co.Pvt. Ltd.; 2) consortium consisting of M/s.Gayatri Projects Ltd. and China Railway Major Bridge Engineering Group Co.Ltd. ; 3) consortium consisting of M/s. Hindustan Construction Co.Ltd. and M/s.SK Engineering & Construction Co.Ltd. ; 4) consortium consisting of M/s. IL&FS Engineering & Construction Co.Ltd. and M/s.IL&FS Transportation Networks Ltd.; 5) consortium consisting of M/s.ITD Cementation India Ltd., M/s.Thakur Infraprojects Pvt.Ltd. and M/s.JM Mhatre Infra Pvt. Ltd.; 6) M/s.J.Kumar Infraprojects Ltd. 7) consortium consisting of M/s.JMC Infraprojects (India) Ltd. and M/s.China Railway Construction Bridge Engineering Bureau Group Co.Ltd. ; 8) M/s.Larsen & Toubro Ltd.; 9) M/s.Navayuga Engineering Co.Ltd. ; 10) M/s.NCC Limited. ; 11) M/s.Obrascon Huarte Lain S.A. and Constructora De Proyectos Viales De Mexico S.A.C.V.D. ; 12) M/s.Ranjit Buildcon Ltd. and M/s.Royal Infra Engineering Pvt.Ltd. ; 13) M/s.Simplex Infrastructures Ltd.; 14) consortium consisting of M/s.Soma Enterprises Ltd. and M/s.China Harbour Engineering Co.Ltd. and 15) M/s.SP Singla Constructions Pvt.Ltd. The last date for submitting the RFP documents is April 5, 2017. The 22-km long Mumbai Trans Harbour Link Project will provide direct access to Navi Mumbai, New International Airport and will also provide convenient gateway to Pune Expressway and further to Southern India.